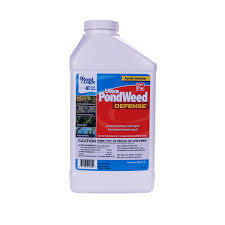 Pond Weed Defense is a safe, rapid-acting contact herbicide designed to work on many species of aquatic vegetation - works best on mature aquatic weeds. Pond Weed Defense is a safe, rapid-acting contact herbicide designed to work on many species of aquatic vegetation - works best on mature aquatic weeds. Treated aquatic weeds will generally drop below the surface in as little as 4 - 7 days. In heavily infested areas a second application may be necessary in 10 - 12 weeks. use in combination with Algae Defense for faster results and algae control. We've priced Ultra PondWeed Defense® quarts to match the MSRP of PondWeed Defense® gallons. However, 1 application of Ultra PondWeed Defense® covers 2x the area of PondWeed Defense® making it a much better value to the end user. Also, please note that the active ingredient in PondWeed Defense® was chelated copper while Ultra PondWeed Defense® utilizes diquat. Pond Logic® Treatment Booster™ PLUS is specially formulated to enhance your pond treatments. Treatment Booster™ PLUS spreads and adheres your treatment to target aquatic weeds and algae. 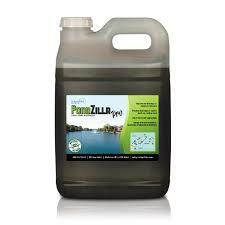 It works by breaking down the surface of the weeds and/or algae, allowing the chemical treatment to penetrate. Treatment Booster™ PLUS also has been enhanced to work on underwater weeds and algae by breaking the water's surface tension. The treatment is sent directly through the water column delivering on target results every time. Mix the amount of Ultra Pondweed Defense® and Treatment Booster™ PLUS (if using) with pond water in a tank sprayeraccording to label instructions. Use a pressurized pond sprayer to spray the Ultra Pondweed Defense® mixture directly onto to the target weeds. Treat only up to half of the pond's surface and wait 10-14 days before a second treatment. In hot weather or when fish are stressed, treat only 1/4 - 1/3 of the pond's surface at a time. For deeper water, place the sprayer's tip beneath the water's surface. Over time, the weeds will begin to brown and die. Once completely dead, use a rake, like the Pond Logic® Pond & Beach Rake, to remove dead weeds to prevent an accumulation of dead plant material and muck. Ultra Pondweed Defense® has no temperature restriction, but it should only be applied when weeds are actively growing. Use with Treatment Booster™ PLUS for best results. Wait 3 days before using treated water for human drinking water. Wait 1 day before using treated water for livestock and domestic animal consumption. Wait 5 days before using treated water for irrigation.